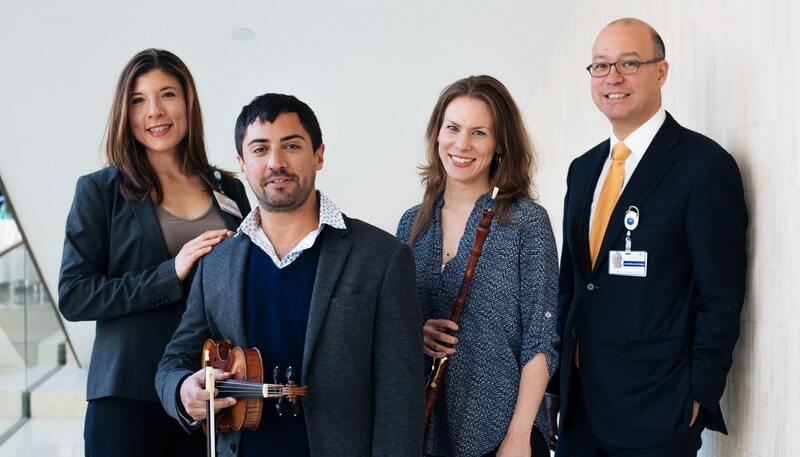 Oboist Kristin Olson met violinist Nadir Aslam when both were undergoing repeated treatments for spontaneous pneumothorax, or collapsed lung), at Mount Sinai hospital. For Kristin, having a recurring collapsed lung was existential: oboists generally need both lungs to play. Nadir Aslam had been suffering with the condition for years. The treatment is pleurodesis via VATS (video-assisted thoroscopic surgery). Kristin had her surgery first, on August 3, 2015. She was able to coach Nadir through some of what was to be expected for his surgery a week later. Both were struck by the loneliness of the restless nights and long days of their stay. Nadir remembers hearing the soothing sounds of the piano floating up to his room from the hospital atrium and knowing immediately that he wanted to bring music to the hospital. Kristin remembers how lucky she felt to have friends and family visit as she saw some patients suffer their illnesses alone. Together, Kristin and Nadir wish to use their musical gifts to bring some comfort and beauty to the patients at Mount Sinai Hospital, and to honour the incredible care they each received from their surgeons, Dr. Andrea Wolf and Dr. Andrew Kaufman, and their countless heroic nurses. So they started a concert series. There are two events left this season: April 21, 2016 from noon-1pm featuring Kristin Olson, Nadir Aslam and guest artists Ūla Kinderytė and Sarah Stone; and on May 30th also from noon until 1pm, with Donald Meineke and the Bach Vespers Choir. Apparently, no music journalist in New York thinks this is a human story worth covering. Visit mountsinaiconcerts.org for more info! Thank you! I am honoured to have met Nadir a couple of years ago, this is exactly the sort of wonderful thing he would do for people. Hospitals are awful places and a concert by talented musicians must bring great joy to those who have to be there for any length of time. Journalists mustn’t have a heart if they don’t think that this is worth covering, perhaps they need a few days in hospital to appreciate this gift. Helene, thank you so much for your lovely comment. I hope too that more people will understand the value of the concerts that Kristin and I perform for patients.